Premium, groaned Tom, thank god we didn’t by the cheap stuff! Without too many more details, suffice it to say it was well into the afternoon before Tom took the wheel. We broke camp just outside somewhere and were headed as far north as we could get after lunch in Volgograd. 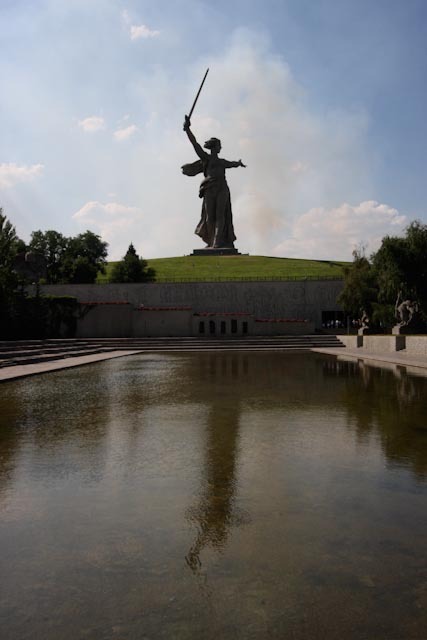 That city, formerly known as Stalingrad, is famous mostly for having given its life to stop the Nazis in World War II. Rebuilt after the war with the Soviets sorry lack of style, the main attraction is the memorial to the city’s heroes during the war. An estimated one million Russian men, women and children died in the battle for control of Russia’s main supply line - the Volga. Casualties on the German side amounted to some 750,000. The centerpiece of the memorial is a huge statue of Mother Russia calling the country to arms. It is an imposing monument which extends downhill to a hall with an eternal flame, a reflecting pool flanked by smaller heroic statues and stylized scenes from the battle for the city. What they lacked in architectural nuance, the Soviets certainly made up for with the sheer kinetic intensity and scale of the memorial. We ate lunch in a kitsch salon festooned with flags of Lenin and portraits of Stalin, along with endless video loops of scenes from the battle for Stalingrad. Souvenir choices included large caliber pen lighters and bullet casing necklaces. Resisting such temptations we were soon back on our way north. The incredibly difficult roads smoothed out at the top of a vast plateau allowing us to make up some time. As the sun set we noticed there were fewer and fewer trucks in the twilight giving us a clearer view of the road ahead. Eventually, we pulled into a truck stop and were accosted by a young man in full combat fatigues, blond hair and a crew cut. We somewhat nervously wondered if we had entered the twilight zone. He asked in Russian if we were looking for a room and I said in English, no only to eat something. We parked and after we sat down the young man reappeared with his cell phone. By typing in Russian it would translate whatever he wrote into English. We would have had quite a conversation except Tom had left his reading glasses in the car and the text was almost too small for me to read. Dinner of borscht and hotpot followed with a smile and a wave goodbye as we set off for bed. Our field that night had nothing going for it other than it was 11pm. Within earshot of the highway and a gas station and overlooking a drilling well we nevertheless crawled into our sleeping bags and slept like rocks until morning bird call. What begins with 'F' and ends in 'uck'?